This entry was posted on Friday, September 30th, 2011 at 9:31 am and is filed under Baal EP: 1982. You can follow any responses to this entry through the RSS 2.0 feed. Both comments and pings are currently closed. I have to admit that I could never get into the BAAL songs. I’ve tried, as I own the vinyl copy. It’s just not to my taste, but I love the fact that it represents another fascinating aspect of Bowie’s career – very unusual. Bizarre that this comes between SM and LD! It’s a pity that a scheduling conflict – there was something more exciting on the other channel – meant that hardly anybody got to see Baal on television. I’m old enough to confirm this EP being played in at least one club. I think it was one of the other songs that packed the dance floor though. Can’t remember which one. the conflict apparently was with a John Mortimer teleplay starring Olivier, in one of his last roles. very excited to hear Baal was actually played at clubs. It’s interesting to note how television has changed over the years. 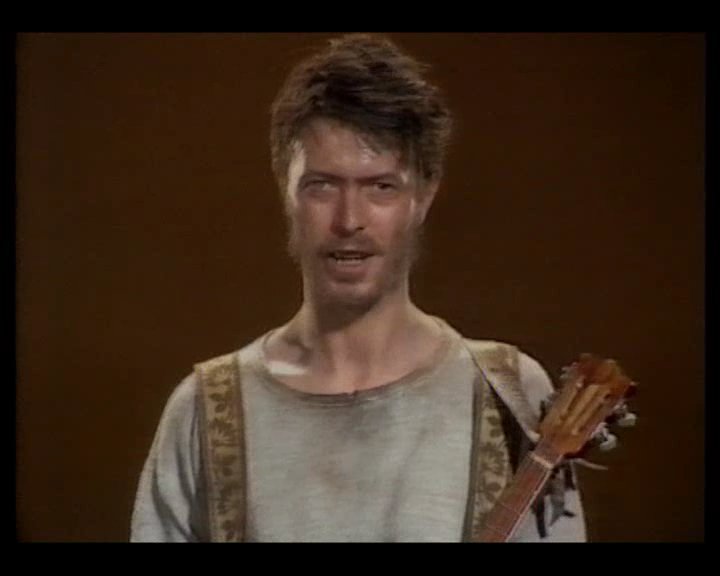 A total of three channels, one showing Bowie in an obscure Brecht play, the commercial channel showing a 2-hour plus serious play, and the other channel reserved for the arty, non-mainstream stuff. When I say it was played in clubs, I can only vouch for one place and that was one of those Bowie night places. I think it was played in an ‘ironic’ way. Does anybody recognise the musicians in the Drowned Girl video? And with that scruffy look, he actually bears a resemblance to his son Duncan Jones. that’s coming up next. no spoilers. Can’t really get into this material, but it sure SOUNDS great. What a voice! This is where the blog’s going to get really interesting for me. It’s made me appreciate old favourites even more but now it will be exciting to listen to Bowie songs I’ve never heard before! I have the ep I bought it at the time though must confess I don,t listen at all to these days will dig it out as I liked drowned girl. Cannot say I enjoyed the tv play which I have and I’m sure its the full show and has an interview with tim rice from the period. Wonderful EP! And, yes, sad that there’s so little about the music or play in print. Got a copy of an 80s Australian TV broadcast from a dear ex- a decade ago, and it’s much better than the usual one ‘doing the rounds’, Also saw a pristine tape of it at the Cinemateque in Brighton. Not sure it was quite ‘legal’, but it was certainly better than VHS. A slave to the BBC confirmed to me long ago that it’s either a rights issue their end and/or Bowie’s not willing to pay the price they’re asking (as with The Midnight Special). Odd as EMI and the BBC signed a deal years ago saying they’d would allow such things to be released… Still waiting for that, but glad the EP got a digital reissue. I am getting more and more prepared to defend the merits of Let’s Dance as part of the Bowie Canon, as I think it’s a fantastic album that people are too down on, but this is nice too. Bowie’s vocals on this one are very nice – they remind me of his old “drama-songs” like Time. With ya there pinstripe Let’s Dance is a superb album great songs ,production is great and performance top notch. People forget how different this sounded and I would say still sounds fresh. I give blk tie white noise a spin yesterday and that has dated badly and I would go as far to say I prefer never let me down as its devoid of any spark with a truly awful cover of cream. I would go as far as to say tonight is genius compared to blk tie , at least we have loving the alien and blue jean. Thanks for this entry. I’d always gone along with the popular wisdom that this was just a minor footnote in Bowie’s career. I’ve completely changed my mind now. These songs/performances are really up there. The video for Drowned Girl puzzles me. I wonder what they were thinking when they made that. Why make the same video twice? Looks like it’s time to brace ourselves for Let’s Dance. I’ve just listened to the EP and realized it’s only the second time I’ve played it even though I’ve had it for a few years. Somehow it’s very easy to forget about Baal but I’m glad you’re making me listen to it now becasue the vocal performance is wonderfully dramatic. Like Pristine Hourglass said it’s remniscent of ‘Time’, only with better lyrics. I dug it out last night and must say I have played it very little ,it was mint. I did not like it at the time I just thought it self indulgent and pretentious , for Bowie that’s saying something. It is very well done and if your like amsterdam I suppose it interesting. Your piece on the work is actually made the work far more important so well done. The play is I suppose worth a look , I remember it embarrasingf watching as a lad with my mum. Much better would have been elephant man but I’ve only a few clips which is criminal. 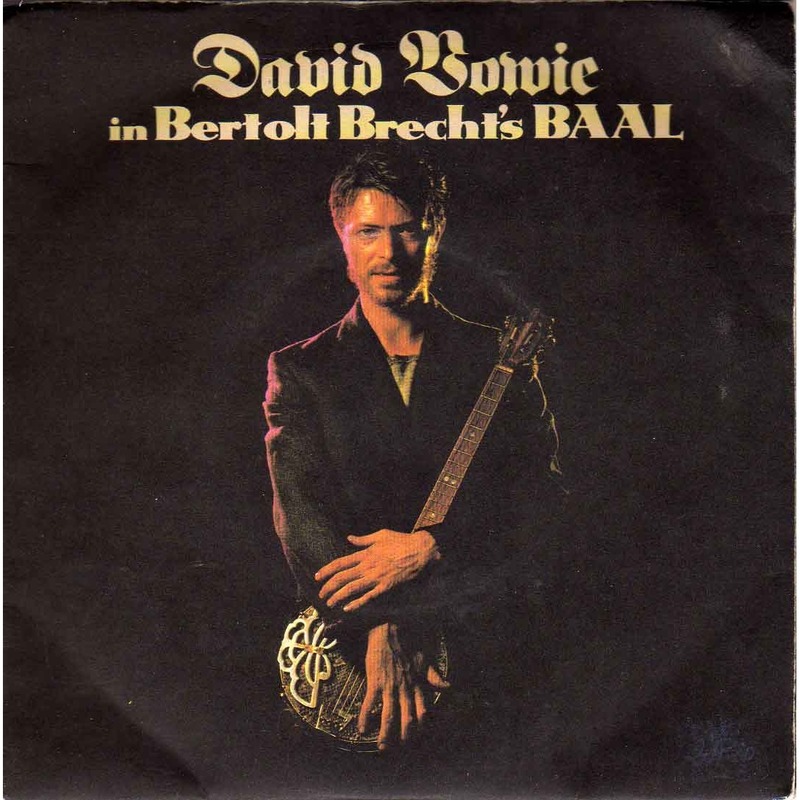 In Baal’s case it’s got to do with the fact almost nobody writes about it – and even Pegg who was my only book on Bowie for many years only mentioned it briefly. Bowie would have made an excellent torch singer, chansonier or what have you. Well he always was one after all, wasn’t he. Baal’s Hymn’s just been added to my iPod (RIP Steve), oh these modern times. The whole of the Baal production is now on YouTube. Pity he mispronounces ‘Baal’. You’d think having ‘pale’ as a rhyme would have been a clue. Ok, historically it would probably have been something like Baa-aal, but traditionally in English it’s pronounced Bail. Certainly two syllables, not one.